Dermatomyositis causes inflammation and damage of muscle and skin, and sometimes involves internal organs, especially lung parenchyma. Patients with dermatomyositis still represent a diagnostic challenge because of the rarity of this disease and the lack of specificity of some of its cutaneous manifestations. Herein, we describe the case of a patient with dermatomyositis, initially diagnosed as psoriatic arthritis, in which the performance of anti-melanoma differentiation-associated gene 5 (MDA5) antibodies was decisive to establish a definitive diagnosis. La dermatomiositis causa inflamación y daño del músculo y la piel, y en ocasiones afecta a órganos internos, especialmente el parénquima pulmonar. Los pacientes con dermatomiositis representan todavía un reto diagnóstico debido a la rareza de esta enfermedad y la falta de especificidad de algunas de sus manifestaciones cutáneas. Describimos el caso de una paciente con dermatomiositis, inicialmente diagnosticada de artritis psoriásica, en la que la determinación de anticuerpos anti-MDA5 fue decisiva para establecer un diagnóstico definitivo. Herein, we present the case of a patient with dermatomyositis with anti-melanoma associated differentiation protein 5 (MDA5) antibodies, initially diagnosed as psoriatic arthritis. A Caucasian 41 year-old woman developed erythematous scaly lesions on hands, elbows and knees, being diagnosed as psoriasis 6 months later. After a month, the patient was diagnosed with psoriatic arthritis when she developed severe symmetrical polyarthritis of large and small joints, that was treated with adalimumab and ibuprofen; methotrexate was not prescribed because of a baseline elevation of ALT and AST. After the fourth dose of adalimumab, the patient was admitted to our hospital presenting a worsening of skin lesions and the onset of severe myalgia and predominantly proximal muscle weakness in arms and thighs, oral ulcers, and mild cough with no other cardiopulmonary symptoms. On physical examination, the patient had pale skin, scaly and erythematous lesions on elbows and lateral aspect of fingers, Gottron papules (Fig. 1), heliotrope rash and extensive paniculitis of trunk and limbs; she also had a mild proximal weakness in upper and lower extremities and symmetrical polyarthritis in elbows, hands and knees. The rest of the physical examination showed no pathological findings, including auscultation of heart and lungs. Photograph showing Gottron papules over the extensor surfaces of metacarpophalangeal joints of both hands. Laboratory analyses highlighted a mild elevation of muscle enzymes: aldolase 13.8U/L (normal values 0–7.6U/L), creatine kinase 220U/L (normal values 20–180U/L), lactate dehydrogenase 522U/L (normal values 135–214U/L). Immunological studies, including autoantibodies of idiopathic inflammatory myopathies (anti-Mi2, Ku, PM-Scl 100/75, SRP, Jo-1, PL-7, PL-12, EJ, OJ, SSA/Ro52), were normal or negative. A neurophysiological study and a muscle biopsy, that showed an intense expression of major histocompatibility class I (MHC-I) molecules on myofibers with no other histopathologic abnormalities, confirmed the definite diagnosis of dermatomyositis based on the criteria of Bohan and Peter.3 It was initially attributed to treatment with adalimumab, since anti-TNF therapy has been rarely described as a trigger for inflammatory myopathies.4 The patient was discharged with analgesics and low-dose prednisone, and a serum sample was sent to an external immunology laboratory to perform additional analyses. A positive result for anti-MDA5 antibodies, detected by a commercial line blot assay (Euroimmun, Lübeck, Germany), was reported three weeks later. Treatment with immunoglobulin and high-dose prednisone was then started. Pulmonary function tests showed a mild restrictive disorder and a decrease in DLCO (48% of predicted value) and a subsequent high-resolution computed tomography of lungs showed a bilateral ground-glass pattern (Fig. 2A), compatible with interstitial lung disease (ILD). The initial screening for malignancy was negative, but extensive calcinosis cutis areas were observed in both buttocks and thighs in an abdominal computed tomography (Fig. 2B). Because of the development of ILD and the unfavourable evolution of skin involvement, with calcinosis cutis and ulcerated lesions on hands and left thigh, tacrolimus was added to the treatment; she was also prescribed alendronate for the treatment of calcinosis cutis. After two months on treatment with tacrolimus, the patient has experienced a normalization of muscle enzymes and a better muscle performance, and pulmonary function is getting better (DLCO 58% of predicted value). Although skin inflammation has also improved, calcinosis cutis persists and its response to immunosuppressive therapy and alendronate has been scarce. (A) A high resolution computed tomography image of both lungs showing a bilateral ground-glass pattern (arrows). (B) Extensive calcinosis cutis localized within the subcutaneous tissue of both buttocks (arrows) in an abdominal computed tomography image. Dermatomyositis is still a diagnostic challenge because of the low specificity of some of its cutaneous features, which can mimic other dermatologic conditions, e.g., psoriasis. The role of specific antibodies is of paramount importance for the diagnosis, characterization of clinical phenotype and prognosis of idiopathic inflammatory myopathies. The authors state that no experiments have been performed on humans or animals for this research. The authors have obtained the informed consent of the patients and/or subjects referred to in the article. This document is in the possession of the correspondence author. We would like to thank Dr. Selva-O’Callaghan for his counselling and support in this case. 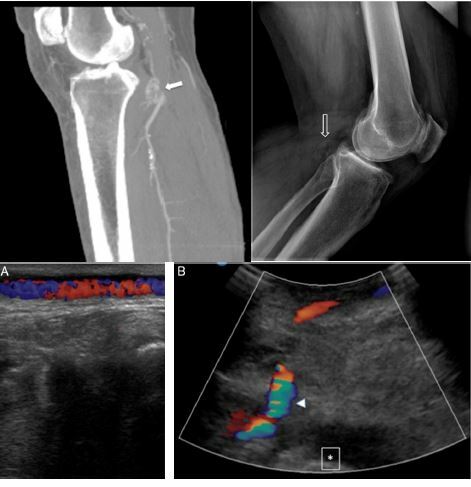 The evolving spectrum of polymyositis and dermatomyositis—moving towards clinicoserological syndromes: a critical review. Polymiositis and dermatomyositis (first of two parts). A.M.G. Brunasso, W. Aberer, C. Massone. New onset of dermatomyositis/polymyositis during anti-TNF-α therapies: a systematic literature review. Gottrons's papule in amyopathic dermatomyositis mimicking psoriasis. D. Fiorentino, L. Chung, J. Zwerner, A. Rosen, L. Casciola-Rosen. A. Ceribelli, M. Fredi, M. Taraborelli, I. Cavazzana, A. Tincani, C. Selmi, et al. Prevalence and clinical significance of anti-MDA5 antibodies in European patients with polymyositis/dermatomyositis. R. Nakashima, Y. Imura, S. Kobayashi, N. Yukawa, H. Yoshifuji, T. Nojima, et al. M. Labrador-Horrillo, M.A. Martinez, A. Selva O’Callaghan, E. Trallero-Araguas, E. Balada, M. Vilardell-Tarres, et al. Anti-MDA5 antibodies in a large mediterranean population of adults with dermatomyositis. C.V. Oddis, F.C. Sciurba, K.A. Elmagd, T.E. Starzl. Tacrolimus in refractory polymyositis with interstitial lung disease.